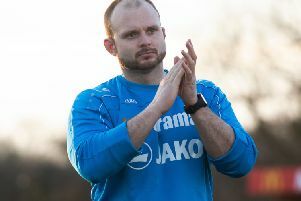 Ten-man Weston-Super-Mare struck an injury time equaliser at Vauxhall Road as Hemel Town squandered a three-goal lead in a topsy turvy 5-5 thriller this afternoon. Hemel raced into a 3-0 lead as James Potton bagged a brace either side of a fine strike from Luke Thomas, but Weston hit back through Dayle Grubb and a Ben Herd own-goal. The Tudors restored their two-goal lead before half-time through Graeme Montgomery, but quickfire strikes from Scott Wilson and Grubb levelled the scores at 4-4. Montgomery put Hemel back in front, before Wilson was sent off for Weston, but the visitors rescued a share of the spoils courtesy of substitute Tristan Plummer’s late heroics. The Tudors went into the game without a recognised striker in the squad, but it did not take them long to open the scoring as Kyle Connolly surged forward from left-back and teed up stand-in number 9 Potton who fired home with aplomb from 12 yards. And it soon became 2-0 as the Tudors continued their flying start to the game, with Nottingham Forest loanee Thomas cutting in from the right wing and launching a vicious 20-yard strike past Weston keeper Luke Purnell. It was a scintillating opening 30 minutes from the hosts, and they added a third goal shortly after the half hour mark as a lovely passage of play ended with Montgomery flicking the ball into the path of Potton, who netted his second of the game via a big deflection. For all their dominance, Hemel were rocked in the 39th minute as the excellent Joe McClennan reached the byline and cut the ball back to Dayle Grubb, who calmly slotted home past Jamie Butler, before Ben Herd deflected the ball into his own net two minutes later for 3-2. The goals continued to flow, though, and Hemel quickly restored their two-goal lead as Montgomery received the ball on the edge of the box and lashed home past Purnell to the relief of the Tudor faithful. The second half started at a frantic pace and Weston had reduced the arrears again within a minute of the interval as terrible defending allowed Ollie Barnes to cross the ball for Wilson to tap home from a yard out. The scores were levelled in the 63rd minute as Grubb curled home a free-kick from the edge of the box, but parity was short-lived as Hemel broke down the other end and Montgomery nipped in front of Purnell before tapping into an empty net to put Hemel back in front. The game took another twist in the 69th minute as Weston were awarded a free-kick after Connolly brought down Grubb, with Wilson responding by petulantly kicking out at Adam Bailey-Dennis and being shown a straight red card. Hemel had a chance to wrap up the win when Thomas broke forward and rounded Purnell, but a defender got back smartly to clear the ball off the line. And that block proved vital as 10-man Weston broke forward in stoppage time, with Plummer turning well on the edge of the area and shooting past Butler to rescue a point for Weston and cap off a crazy 90 minutes of football. Hemel Hempstead Town: 1 Jamie Butler, 2 Ben Herd, 3 Kyle Connolly, 4 Louis John (12 Terrell Forbes, 40 mins), 5 Adam Bailey-Dennis, 6 Matt Spring, 7 Mitch Brundle, 8 Michael Richens, 9 James Potton (14 Ogo Obi, 84 mins), 10 Luke Thomas, 11 Graeme Montgomery. Subs not used: 13 Jack Smith, 15 Joe Fitzgerald, 16 Ben Johnson. Weston-Super-Mare: 1 Luke Purnell, 2 Sid Camper, 3 Ollie Barnes (Tristan Plummer, 76 mins), 4 Jacob Lane, 5 Pat Keary, 6 Clayton Fortune, 7 Joe McClennan, 8 Jason Pope, 9 Scott Wilson, 10 Dayle Grubb (c), 11 Alex Byrne. Subs not used: 12 Ben Withey, 13 Tyler Davis, 14 Jamie Edge, 15 Jake Mawford.